Chlanua vs Chlarina - Could it be a typo? Certified Birth Certificate for Genealogy? As genealogists we use birth record/certificates to confirm parent's names and the maiden name of a mother. These certificates also confirm dates and counties that may give us a genealogical clue. But birth records are often protected by privacy restrictions. In a "closed states" they often hold a 75 year privacy restrictions, but may be longer in some states. Based on the purpose of research, we may need a certified birth certificate. This is usually needed to prove generational kinship for applications, especially for government officials. A good example is for Dual Citizenship. International governments usually need proof of kinship. An example is the requirement to trace an (i.e. Italian or Greek, etc.) immigrant ancestor. The birth, death and marriage certificates must be accurate and all agree, especially in the spelling of names. If your Great Grandmother, and Italian immigrant is Chlarina, it will not be accepted by the Italian Consulate if it appears on the any certificate as Chlanua. Sure, one would think that a certified birth certificate is correct. But it involves a "human" transcribing and deciphering the original handwriting of a ledger. I have received certified birth certificates with date errors, and misspelled names. If birth certificates, or other vital records are incorrect, each state (or county) have documented procedures to correct them. With proof - birth, marriage, divorce records - a notarized statement or affidavit may do the job to correct a birth certificate. But there are some states, that may require expensive court orders to make changes to vital records. Pennsylvania is one of those states! You may not have a corrected birth certificate in Pennsylvania without a court order involving lawyers, court costs etc. But what if the error was from hard to read handwriting in the original ledger. Don't accept the birth certificate without first rechecking the original ledger! 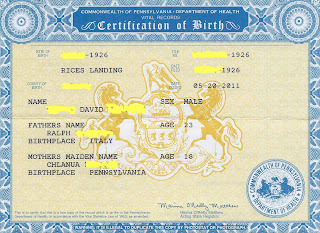 Recently, I had just this happen to a birth certificate. The mother's name was totally incorrect. Chlanua? It should have read Chlarina, a good Italian name. After requesting an official review, sending in a copy of a marriage, divorce, and death certificate all with the correct spelling of Chlarina, the Vital Records Correction team of this Pennsylvania county reviewed and determined that poor handwriting caused the confusion. 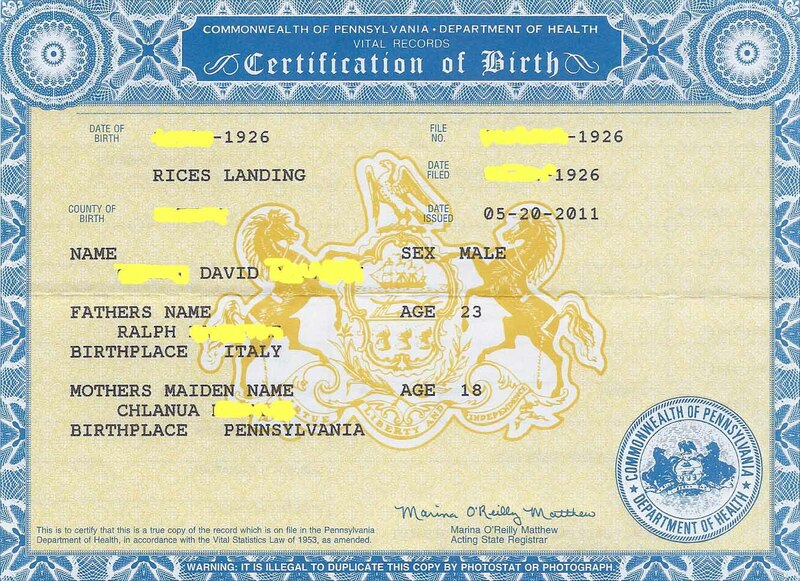 The certified birth certificate was reissued with the correct (and needed) spelling of the mother's name. Saving the client hundreds of dollars.